These are some notes copied from a document written by a descendant of Jesse Gazzard who immigrated to New Zealand with his family on the sailing ship "Douglas" arriving belatedly in Wellington 22nd October 1874 after leaving England on the 2nd July the same year. They have been copied almost exactly as the original and only obviously incorrect spelling altered.These notes were originally handed on from Flora Simpson a Grand Daughter of Jesse's daughter Eliza Caroline born August 10 th 1870 at Poplar London and died at Masterton New Zealand 24 th April 1963, who married Alexander Alfred Burling born 23 rd September 1869 Bankside Whareama N.Z. died 3 rd July 1941 Masterton N.Z. Eliza's recollections are the probable source of this information. Please note that the district of Taueru mentioned in this article is now spelt Tauweru probably reflecting the truer Maori pronunciation. Any person is welcome to use this information by ackowledging its source www.gazzard.net although no guarantee is given as to its accuracy or otherwise. Editor Ian Gazzard Wanaka 9192 New Zealand 2001. Eliza Caroline Burling nee Gazzard born April 12 th 1868 at Poplar London England - her parents were Jesse Gazzard and Sarah Ann Gazzard nee Whitmore. Charlotte Elizabeth Gazzard born August 10 th 1870 at Poplar London. Charlotte Ann born 8 th January 1827 Married Joe Wallace a Scotch man. Sarah born 23 rd November 1836 married Jim Springett. William born 15 th November 1828 Died after Gibralter. Eliza born 1832 died young. Daniel born 14 th June 1830 Went to Ballarat Australia. Elizabeth born 14 th June 1834. Married a Portuguese Nioa.Went to Australia. Emma born 20 th February 1839 Married Pope a pilot ship England. Edward born 19 th October 1843 Married Matilda Pottle. Lived Creswick Melbourne Australia. Joseph born 18 th September 1846. a sailor never married. Died Australia. Sarah Whitmore married twice. First marriage to Harris. Born 3 rd August 1836. Her sisters and brothers were Eliza Whitmore married O'Connor. Ambrose twin to Eliza. Family David, Thomas, Elijah. Abigail Born 1 st March married a Witney - Daughters Caroline born 29 th May 1866 died 1 st January 1919.and Florrie Witney married Thompson. Nelson. Jesse Gazzard's mothers name Chinery. Jesse Gazzard's Grandfather Chinery was sent to India as a soldier and never heard of again. Jesse Gazzard and Sarah Whitmore married in London. Jesse Gazzards mother's relations well to do. A place in Kelvedon called Birch Hall was theirs and a solicitor did his cousins out of the property. His mother's sister ......... Chinery married a Doctor and went out to the Colonies. Jesse and Sarah Ann Gazzard and their two children Eliza Caroline and Charlotte Elizabeth came out to New Zealand on the sailing ship DOUGLAS. Left England end of June, arrived in N.Z. just before Christmas. Captain Wilson had never been to N. Z. before, when he got to to Wellington he passed the harbour, a young man on board said he would bet anyone 5 pound they had passed the Harbour. Captain told him if he was not quiet he would put him in irons. The ship sailed into Cook Strait and another ship came as near as possible, spoke to the Captain through the speaking trumpet, asked what ship it was and Captain told S.S. DOUGLAS. He asked who he was speaking to, reply Captain Wilson, Captain Wilson dead or alive? Captain Wilson said very much alive. The other Captain said you should not be a Captain of a passenger ship, you were reported in England when I left as at the bottom of the sea and if your not out of here quick you will be at the bottom of Cook Strait, good day. Had not long left when the rough weather started and the ship was going down. Main sail busted and that saved the situation, he sent for the young chap that he was going to put in irons and asked him if he was sure they had passed the harbour, he said "I ought to know I was born there". The Pilot ship came out from Wellington and all passengers were put on Soames Island because they thought there was a disease on the ship on account of so many children dying on the way out. 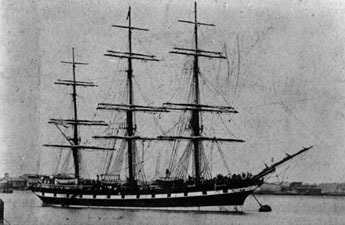 Later Brown town clerk of Masterton lost all his family on board ship. Passengers , Byfords, Gardiners, Fletcher. The children on Soames Island thought it was paradise and gathered lots of flowers after being on ship for so long. From Wellington you came by coach to Greytown and stayed there over Sunday then left for Masterton. Government cottages were being built then but none were ready so they went into the Maori redoubt in the Masterton Park. Then Jesse Gazzard and the Fletchers were given the first cottage till the rest were built. Hope street houses were the first Government cottages. Did not stay there long and went to Taueru and it was mud and slush round the swamp at Taueru. The driver had to whip the horses to get them out of the mud. The driver was Ern Spackman's father. That was the time of the building of the 2nd Taueru Bridge. Jesse Gazzard was building a house between school and Duffy's. On school side there were several cottages there while bridge was being built. When they went out, no windows only calico and two rooms only later a lean to. Later he bought the section opposite the school and moved the builders two roomed cottage from Duffy's section and pulled down his other cottage and built it on the back of builders cottage. They ferried across the river by boat while the bridge was being built. The men rowed the passengers across. When he returned the passengers were supposed to see him safely back to the other side, one day they did not stop, boat was later found upside down and the man Watson was never found. He was the proprietor of the Taueru Hotel. Sunday school started at the blacksmiths residence, on the left hand side of the road to Beethams kept by a Mrs. Nielsen, she was a miss Baillie from Greytown. No public school but a private school down Beetham's road. 1/6 a week for two children. Mrs. Jones was the teacher. Mr Jones had a little shop opposite where Riddles were on corner of Beethams road. She had a good many children. Pupils 3 from hotel and 2 Gazzards amongst them. School had to be given up. A good teacher but too fond of the bottle so they left the district. A sawmill the other side of the river cutting timber for the bridge then they came over. Cut timber on Wardell side of river, then fire broke out, swept through the bush. Jesse Gazzard's cottage full of people and children. One large tree at back was a fire down the bank, men threw a rope over and broke the bough so it would not come down on the house. They beat the fire out and the rain came. Sarah Ann Gazzard went out maternity nursing free for many years. Walking many miles to and from her patients. To go to a patient at Blairlogie they bought her a horse and it was the first time she had been on a horses back. Mr. Hugh Morrison brought her back as he accompanied her on her way to Blairlogie. She also attended Vallances, Maces, Bennetts. Rupert Morrison was one of S. A. Gazzard's babies. The Taueru school was built. St. Albans church was built. Abbotsford was once owned by a man named Gilligan and he decorated up the drive of Abbotsford and his buggy house and a long table in centre of buggy house, and meals free for everyone at the opening of second Taueru bridge. A do the writer attended and she still has the green and white rosette presented by Mr. Whatman to all school pupils when forming a guard of honour outside the school for the wedding of Eila Vallance and Erl Williams. The Taueru bridge was decorated and the writer was also a witness to her first car accident when bringing home the cows. Dr. Hosking and Sir Walter Buchanan went over the bank opposite Duffy's. Fortunately for them Dr. Hosking was following. Another bush fire in the district was at McHatties mill and later the Weraiti fire. Mrs. E. C. Burling followed in her mother's footsteps as a maternity nurse, her first baby being Bob Garrett. She later nursed in Masterton and Palmerston North, nursing till the age of 84. Memories of Micky Dalton a remittance man from Ireland had great eyesight and could look at the sun, and asking others could they do so and on saying they could not were told they must be wicked. Riddle's rock now removed was the scene of many accidents with overturned buggies. Riddle's store and accommodation house was used very much in the days before motorcars and well do we remember the little newspaper horns filled with lollies for 1 penny or if being served by W. Riddle would be given free. Well do we remember the days when the Beethams were driven in their coaches, and livried coach driver passing the door and the sweets we received on their return from Masterton. Toll Gate was kept by McGee then late McCalmonts, this was just past where Angus McKenzie now lives. Toll was 6 pence every horse. At one time toll gate went missing, having been put down the river so no charge for driving through. The first Taueru hall was down Beetham Road. Everyone donating 1 pound towards cost of building. The new hall opposite was built and opened before the school jubilee. Finn Hill had the last blacksmith's shop at the Taueru. Nielsen had the first blacksmith shop and later Olsen and his brother-in-law. The Post Office was first at the Hotel then later in house opposite and Alex Taplin was the Postmaster and it was later a Post Office separate opposite and not far from the Hotel. This was later closed and now served by rural delivery.Hotel was once a 2 storey building now only one storey. Transport in the early days was by bullock teams. First Cameron Brothers Tinui. Wool carted by bullock teams and horse wagons and now motor lorries. Walking to and from Masterton to do shopping was undertaken by Mrs. Burling and her sister. Later acquiring a horse and riding side saddle then followed the buggy days. One Christmas returning from town, horse took fright from tractor engine driven by J. McLachan and broke the shaft and left passengers and the buggy in the stream. Maori pah was quite big comprising two sections of the community. One section ruled by Te Huki and the other by Queen Sarah and Chief Abraham and whenever Chief Abraham was ill they always went to Mrs. Gazzard to prepare his food. During after a big earthquake the chimney was faulty and Mr. and Mrs. G. Burling's house was destroyed by fire loosing nearly everything. Jesse Gazzard died at Taueru 1899 and the farm was carried on by Sarah Ann Gazzard and her daughter Charlotte and foster daughter Alice Page. Later the three moved to Masterton and conducted accommodation houses in George Street, Lincoln Road and Wrigley street. Mrs. Gazzard passing away at the latter place. Burling's took over Gazzard's place at Taueru after they left and were in occupation till 1914 when Mrs. Burling drew a farm at Kaituna ( Falloon's Estate) in a ballot and she farmed here till early 1920. Then they left and took a farm at South Road. Then moving into Masterton in 1922 when she took up maternity nursing. Butter was made in wooden churn by turning the handle and the beaters went round. Butter was traded for stores 4 pence a pound. Later years an Alfa Laval separator was bought and a barrell churn which went over by pushing. Candles were made from tallow and wick down centre which was fixed with sticks to keep taut and then the hot tallow (sheep's fat) was poured in and left to set. Irons used were heavy and live coals were put in ti heat. Later flat irons then Mrs. Pott Cooking was done in a camp oven, fireplace was a clay chimney. All cooking including bread was made in the camp oven. Later a a Colonial oven set on bricks with a fire underneath then followed the Orion stove range with hot water boiler on he side. No concrete in those days and cow yards were all mud in rainy seasons. cows were up to their knees in mud. Pig killing days were fine days. Copper fires were lit to boil sufficient water for scalding and then a large wooden barrel (ex beer barrel) was set up and pig killed, water 2 hot to 1 cold and pig immersed in scalding water and all hands scrapped the hair off then out came a clean pig hung up to be opened up and cleaned inside. All edible parts were kept, nothing wasted. Pigs head cooked and brawn made and trotters were cooked and enjoyed. The bladder was cleaned and blown up and used to put in the lard. When there was a spare bladder it was blown up and given to the children for a football. Pig was salted and cured in a wooden container, this pork had to be continually turned and rubbed hard and very cold on the fingers on a cold and frosty morning. After curing it was smoked in a shed without ventilation ( smoking sawdust was used for smoking). The bacon was then hung up in the ceiling room over the passage and to get this you had to bring a ladder. Onions were also stored in the room. An incident in the bacon curing, Grandfather had been to town and came home with new ideas, he had 2 packing cases and removed one end from each and stood one on top of the other, put in smoldering sawdust and the pig was hung inside the cases but evidently the cases had been stood on the sawdust and by morning the bacon was alight. Another incident. The driver of the W.F.C.A. (Wairarapa Farmers Cooperative Association) horses and brake had stayed too long at the local hotel and when he was leaving a said " God help anyone he meets" and he met Mrs Burling on the road, she saw him coming and pulled off the road in horse and buggy close as she could get alongside the blue cutting but the other driver came at such a rate and not knowing what he was doing or where he was going coming straight for Mrs. Burling and took of her buggy wheel. Her passengers were the school teacher and his son. This caused a long que and assistance was rendered by messes Vallance and Mace who helped put the buggy over the bank and conveyed the passengers to Taueru. The W.F.C.A. driver was only concerned about the W.F.C.A. getting to hear about it which they did before he got to Masterton and he was greeted on his arrival,(How many wheels have you taken off?). Mrs. Burling's horse followed behind Mr. Maces car keeping pace and when they arrived home just neighed and whinnied and went to feed on the grass.